the bicycle sitting in the test area of the vast washingmachinepost bikeshed is a colnago clx, outfitted with 2009 campagnolo centaur ten-speed levers, brakes and rear mech. since this will be, by post standards, a long-term test, you will have to wait until next month for a frighteningly in depth review of arguably the first of colnago's revolution. but meantime, it has proved itself a very willing and more than adequate test-bed for one or two extraneous components, the latest of which is a set of zero g titanium calipers, kindly supplied by uk distributors, otago cycle sport. titanium is a metal that is actually heavier than aluminium, and if truth be told, less rigid too, so while the letters ti appended to the product nomenclature may infer that the predominance is owned by titanium, you - like i - would be wrong. the calipers arms are 7075 aluminium, deftly aided by a few other varieties of al and some stainless steel bits. the titanium restricts itself to the centrebolt, the cam latch, barrell adjuster and bolts. combined into one aesthetically pleasing product, the weight reaches a rather svelte 133g, around half that of either dura-ace or record. i will confess that were i to consider myself a weight weenie, brake calipers are possibly the last feature i would think of making lighter, mostly because i tend to think of brakes as being in the perfunctory domain, and therefore beyond the pale, so to speak. however, if the intention is to make the bicycle substantially lighter without compromise, then i suppose brake calipers are fair game. the zero g brakes claim to be self-centering, though i think their description is a touch different from my understanding of the phrase. normally there's a small serrated washer that fits between the brake and the frame: however, the zeros are bereft of such, but do posess an adjustable spring nut with spanner flats. once the brake is bolted in place on the frame, the caliper can be relatively easily centred using a 13mm spanner. 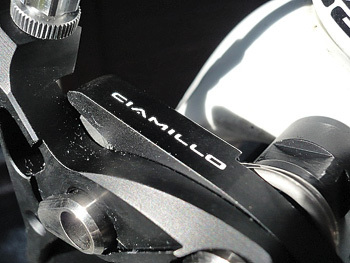 today's groupset brakes are either dual pivot or, in the case of campagnolo, single pivot also; the zeros use a delightfully efficient cam system that promises efficiency in spades. 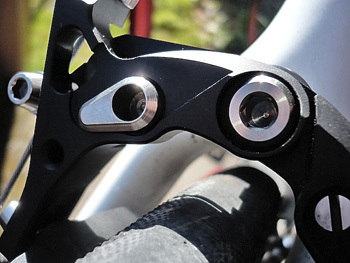 designed with the racing cyclist in mind, this allows for a greater space between pads and rim; basically put, the cam allows for increase leverage as the lever nears the bars. 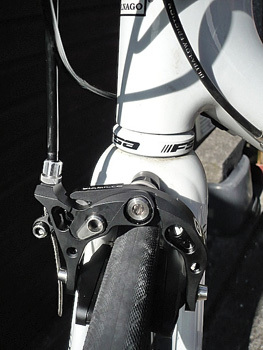 for reasons i have not yet fathomed, the cabling procedure for front and rear brakes differs: the rear was fitted without undue stress in normal fashion with the supplied shoes and pads, but the front brake proved more of an intelligence test. disappointingly, the enclosed instruction leaflet does not explain or illustrate this differentiation, nor does it show how to fit the front cable. however, this is islay, where rushing is not recognised, and after exploring one or two options, accompanied by much humming and hawing, obscurity prevailed. both calipers have a rather slick, built-in quick release, though this is rendered unnecessary on campag equipped bikes by their lever based release. being one of those folks unwilling to bend over a ground-based stationary bicycle, all was carried out on a workstand; spinning wheels and grabbing brake levers did not fill with confidence, since there seemed to be very little feedback from the latter, even after a myriad of minor adjustments. i was figuring on this being a very short test followed by a particularly short and scathing review. fortunately for you and i, initial impressions are not ones i usually pay much attention to (self preservation - mine are usually wrong). you really wouldn't think there could be much difference between one set of brakes and another, but it seems this is not so. it would seem perfectly acceptable to expect a bit of a difference between production models and the more bespoke end of the market, but i really wasn't ready for this much of a difference. taking lead from my less than impressive workstand reaction, fingers tentatively pulled on carbon levers on approach to the first road junction on the exploratory ride. the amount of pressure required to have pads reach rims is almost non-existent - flip the levers to face the rider, and a bout of heavy breathing could probably stop the bike. but the secret weapon is the modulation: i've ridden bikes with light fingered brakes before, but generally the action is either on or off with no comforting middle ground anywhere to be seen. not so the zeros. despite stopping power well in excess of that required on a road bike ridden by me, there was never any suggestion of acrobatics over the bars. the brakes imparted every gram of feedback a rider could ever need or want, allowing a degree of stopping power i honestly didn't think could be had. now it is somewhat necessary to offset my oh my gosh reaction against the price. a set of bog standard zero g ti calipers will lighten your bank balance to the tune of £425 (though our friends across the pond need only part with $345, which seems a tad iniquitous), but if you absolutely have to have the ultimate at any cost, these will surely be darned near the top of any list you care to compile. standard sets can be had in black or red, while, for a few extra pounds (25 to be precise), you can have custom colours. the mechanicals are identical. a truly wonderful set of brakes that i'm worried are going to make the regular fare seem positively mundane.